Ideal for offices that want to add wide-format printing without sacrificing productivity and print quality. Robust, high-performance printer produces fast black and white printing at speeds up to 21 ppm with 1200 dpi resolution. Handles many types of media at the same time, including wide-size paper up to 11 x 17 inches. Offers affordable, reliable and quality wide-format printing at a reasonable price. Ships with a 250-sheet paper feeder; add optional 250-sheet and 500-sheet feeders for a total input capacity of 1, 100 sheets. Ships with a 100-sheet multipurpose tray. HP LaserJet 5100N Series printers provide a superior network printing solution that includes industry-leading HP Web JetAdmin printer management software and HP JetDirect 600N internal print servers. What's more, every printer comes with one feature you can't get anywhere else HP's unparalleled reputation for quality, reliability and compatibility. 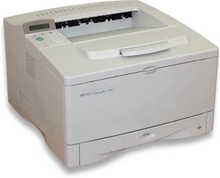 Special Features: 11x17 printer with wide format 12.28" x 18.5"
Copyright © 2006 U.S. LaserTechs. All Rights Reserved.